The man talking to the camera in the video is Jamaal Maaruf, the leader of Shuhada Jebel al-Zawiya Battalion (thanks for Asher Berman for that ID, who explains that the battalion has been attacking Abu Dhuhur air base for 6 days, and the jets are being used to attack civilians. Fadi Mqayed highlighted this earlier video of the MiG-21 shot down in Idlib several days ago which shows it having the serial number 2271, while the new video has the number 2280, confirming this is a different aircraft. 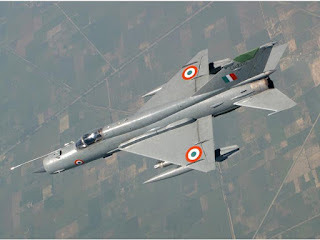 As of yet there's no reports on which weapon was used to shoot down the aircraft. Update September 5th Reuters has more details of the incident, quoting opposition fighters as saying the jet was shot down by 14.5mm anti-aircraft guns, likely a KPV heavy machine gun. They are very careful to point out the serial numbers. In the earlier video, one of them goes so far as to dust the number off with his foot (strange behavior, not the first thing one does when confronted with aircraft wreckage, unless they have future uses for it), in the newer one the gang leader directly points the number out. So... my guess is it's the same plane, they just painted a different number on the tail section in the newer video apparently after dragging it elsewhere. 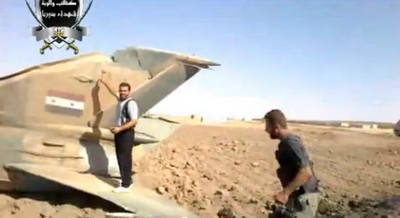 Compare the remains of each aircraft, the earlier video has far more damage shown in it, so it seems unlikely. You should also examine the second video for evidence it was dragged into the field. BM, check this out http://theaviationist.com/2012/09/06/syrian-flag/ apparently the Syrian flag is painted incorrectly (the stars are upside down). and it has a picture where you can see that the last two cyphers in the serial number look like they were messed with. I'm more than ever convinced it's the same plane. And the stars are upside down because they painted them while the tail was lying on its side on the ground. The disformed Syrian flag on the 2280 leads me thinking someone without a steady hand painted it in a big hurry. A recent donation from Iran?